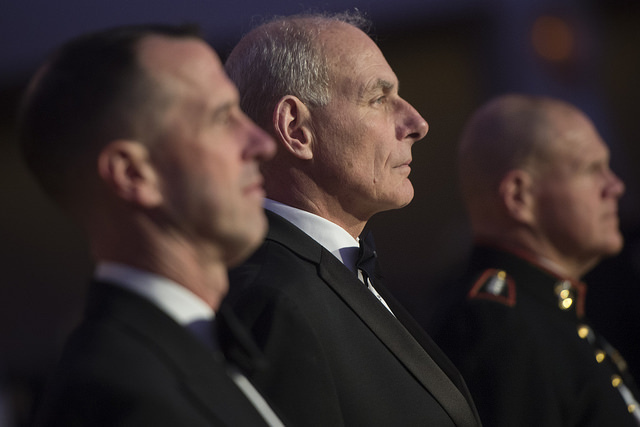 According to The Washington Examiner, Department of Homeland Security secretary John Kelly said that marijuana is a gateway drug during a speech at George Washington University on Tuesday. “And let me be clear about marijuana. It is a potentially dangerous gateway drug that frequently leads to the use of harder drugs,” says Kelly. “[U.S. Customs & Border Protection] will continue to search for marijuana at sea, air and land ports of entry and when found take similar appropriate action.” The DEA recently dropped any mention of the gateway drug theory. Many argue it is a myth propagated by drug war stalwarts and even the National Institute on Drug Abuse won’t call it a gateway drug anymore. During a crime committee meeting this morning, Attorney General Jeff Sessions mentioned a link between the illegal marijuana trade and cartel violence. “We have quite a bit of marijuana being imported by the cartels from Mexico- this is definitely a cartel-sponsored event,” says Sessions. According to The Washington Times, Sessions mentioned violence involving marijuana distribution in the nation’s capital, Washington D.C., where cannabis is legal. “So it remains a significant international criminal organization, the marijuana network,” says Sessions. This is not the first time the Attorney General has suggested a link between the plant and violence. Back in February, Sessions claimed that legal cannabis has led to an increase in violence. The statements made this morning are the latest in a series of contradictory and uncertain messages on federal cannabis policy by the Trump administration. “DHS personnel will continue to investigate marijuana’s illegal pathways along the network into the U.S., its distribution within the homeland, and will arrest those involved in the drug trade according to federal law,” says secretary Kelly. That message, however, contradicts statements he made earlier in the week. During a Sunday interview with NBC’s “Meet the Press,” secretary Kelly told Chuck Todd “marijuana is not a factor in the drug war.” In that interview, he went on to add that methamphetamine, heroin and cocaine are the real culprits they are after, noting the high death tolls associated with the drugs and connection to organized crime in Mexico. The Trump administration still has not issued a clear, consistent position on federal cannabis policy.